Club members had the pleasure this past week to welcome Allen Gilliss as our speaker. A native of Napan, he is a founding director of the Napan Agricultural Show, past president for 20+ years, and a driving force behind many show projects including the current Roof Project. Allen reviewed the origins of the show, how it has evolved into its current form, and the lineup of events for this year. The Napan Agricultural Show will happen Aug.9-12, with more information available at www.napan.ca/show. 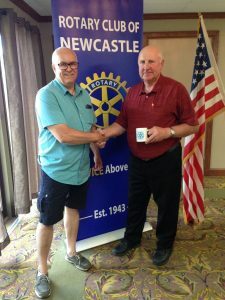 Pictured (Left to Right) is Rotarian Francis Malley thanking Allen Gilliss.